Juniors Lisa Lenzmeier, Matt Mehr were chosen recently as the Girl and Boy Stater. Juniors Michael Mueller and Ashley Spanier, werre chosen as alternates. Juniors Lisa Lenzmeier and Ashley Spanier were chosen recently as the Girl Stater and alternate. 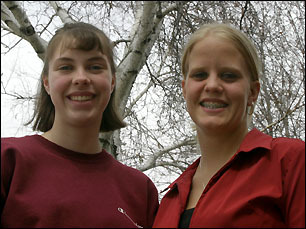 Lenzmeier, the daughter of Dale and Mary Lenzmeier, is the Girl Stater. She will attend Girl State Camp at Bethel College in Arden Hills from June 13-19, sponsored by the Paynesville American Legion Auxiliary. Lenzmeier was interested in becoming the Girl Stater, so she could attend camp and learn more about government through the hands-on camp experience. At camp students learn about government process through practice, holding mock legislative sessions and having model city governments. "It's such a learning experience," said Lenzmeier, "and a chance to meet new people." Junior Lisa Lenzmeier (left) was chosen as the Girl Stater from PAHS this year. She will attend Girl Stater Camp in June. Junior Ashley Spanier (right) was chosen as the girls' alternate. "It should be quite an experience," she added. "It should be a lot of fun." Paynesville's Girl Stater was chosen by a vote of the staff. Interested girls must rank in the top half of their class academically. Both Lenzmeier and Spanier, the daughter of Dean and Jeanne Spanier, have other responsibilities as well, such as helping at baccalaureate on Sunday, May 23, and at graduation on Sunday, June 6; reading at the Veteran's Day and Memorial Day services; and giving daily afternoon announcements and leading the weekly Pledge of Allegiance at PAHS next year. 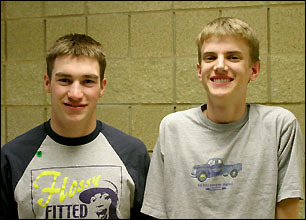 Juniors Matt Mehr and Michael Mueller were selected last week as the Boy Stater and alternate. Mehr, the son of Ann and Ralph Mehr, will attend Boy State Camp at St. John's University from June 13-19, sponsored by the Paynesville American Legion. The Boy Stater and alternate were chosen by a committee based on an interview, held last week, and an essay. Stater candidates could choose their essay topic from a list of choices. Mehr wrote his about deforestation and protecting the environment. Mueller, the son of Bev and Butch Mueller, wrote his essay about overcoming terrorism. Junior Matt Mehr (right) was selected as the Boy Stater from PAHS this year. He will attend Boys State Camp at St. John's University in June. Junior Michael Mueller (left) was selected as teh boys' alternate. Mehr said he applied for Boy Stater because he really wanted to go to camp and he really wanted the scholarship. "I really like history, and I'm starting to learn about government, and I like it, too," he said. Mehr is excited to learn more about government through the hands-on camp experience, and he wants to represent Paynesville well. Boys State Camp, like Girls State Camp, allows students to learn about government through practice, holding mock legislative sessions and having model city governments. Mueller's older brother, Josh, was a Boys Stater, and he encouraged Michael to apply. "My brother went and he said it was a good experience, and everybody should try (to go)," said Michael. The Boy Stater and alternate, like the Girl Staters, have other responsibilities as well: helping at baccalaureate on Sunday, May 23, and at graduation on Sunday, June 6; reading at the Veteran's Day and Memorial Day services; and being responsible for raising and lowering the flag at Paynesville Area High School.